Deptford 2007 by Artmongers. Oil Based Masonry Paint. It is the third mural on the site. 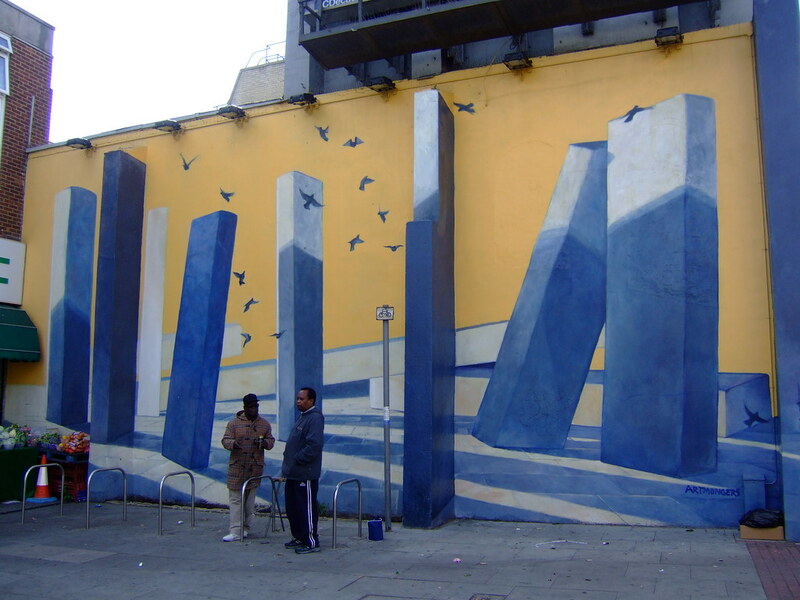 There was painting there in the 1980s and a mural created in 1996 by Stan Peskett as part of the Deptford City challenge. Artmongers removed the boards the previous mural was painted on and cleverly incorporated the Trompe l'oeil technique to hide three large buttresses in a work designed to provide a sense of the passage of time. As with Artmongers nearby His and Hers mural, Patricio took an interventionist rather than narrative approach taking the physical environment as his starting point. The design process involved making a maquette of the mural in order to get the light right and giving it a film set feel. All murals involve the community in some way and this work attempts to do so by making passing shoppers a part of the choreography of the piece, rather than the subjects of the work or passive spectators. It is a background designed to make the mundane extraordinary and has been used as a backdrop for a number of arts events including an annual collaboration with the Laban Dance Company such as this Contemporary Tea Dance in 2009. The mural is in fair condition. From Deptford Train Station take a left onto Deptford High Street. Keep walking down the street towards New Cross Road. When you hit the junction with this road, take a right. You should see the mural up ahead on your left.